Each pattern piece will have a line drawn on it to indicate the grainline. Simply put, it just indicates the direction you will lay the pattern piece on the fabric. The most common grainline that you’ll be likely to run across is a vertical line running from top to bottom of the pattern. This line means that your pattern piece should be placed on the lengthwise grain of the fabric. 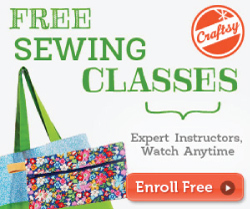 Another common grainline that is used a lot in commercial sewing patterns is the term foldline. Don’t let this confuse you…it’s the same as the vertical grainline, only the pattern is cut on the fold. Marking your fabric accurately is important. When putting a garment together, it involves a lot of steps and specific orders of operation. So, keeping everything marked and in order will come in handy! The most common markings you’ll need to transfer are darts, tucks, pleats, buttons, foldlines, and pocket placements. 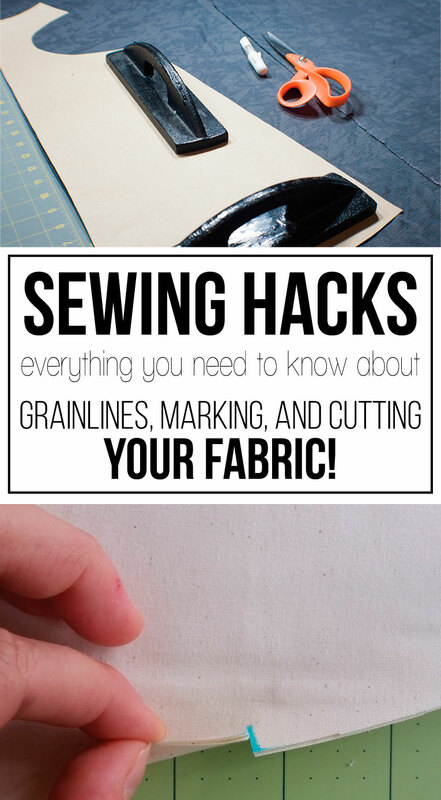 There are a lot of tools to mark your fabric and honestly, which marking tool you use will depend on the pattern and the fabric. Disappearing chalk: This chalk will disappear on its own after a few days or with the heat of an iron. I really like to use this on fabrics like denim. Wash-out pencil: This marking pencil is best sued for dark colors. It will wash out w/ a drop of water. This works well for woven cottons. 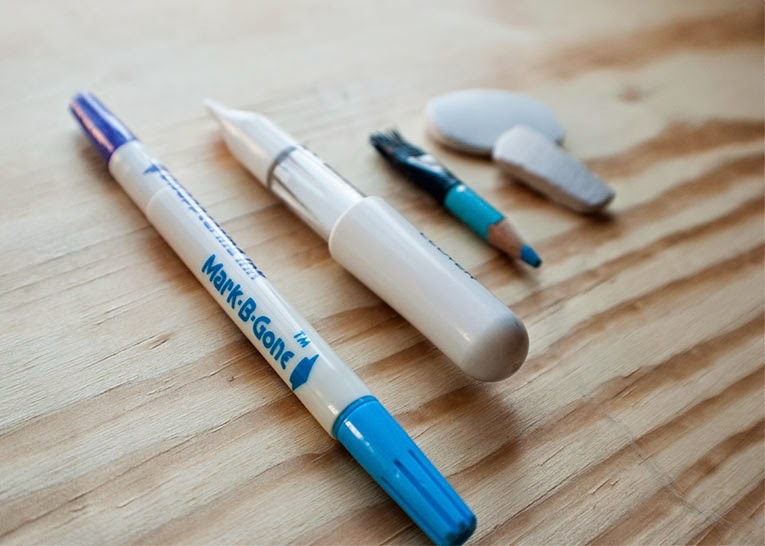 Vanishing Marker: This marker is best for light colors. I like it better than a pencil because it is a felt-tipped marker. I also prefer the one that has two sides, the ‘disappearing ink’ and ‘marks be gone’. One side disappears in 12-24 hours and other side will wash out. I like to use this marker for just about anything! Tailors chalk, rotary: Tailors chalk is another one of those ole’ tried and true dressmaker’s tools. You can get a neat chalk holder to go with it so you don’t get your hands all chalky. I am also a big fan of the rotary chalk pencils. They are filled with a powdered chalk and have a wheel that dispenses the chalk nicely. The rotary chalk pencil won’t work for everything (like knits) but, it’ll work great on most woven’s. I love this rotary chalk pencil from Clover. Scissors: Yup, that’s right, scissors! Scissors work well for snipping notches and darts. I adore all things Gingher, and these gingher embroidery scissors are my favorite tool for the job! 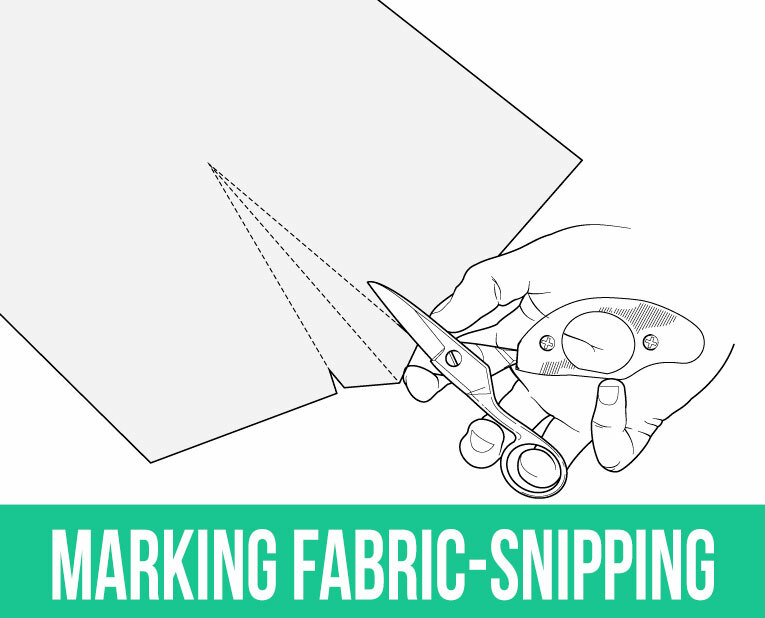 As I mentioned above, snipping notches and darts (or even tucks, pleats, foldlines, and center front and back) is a super fast and super accurate way of marking. 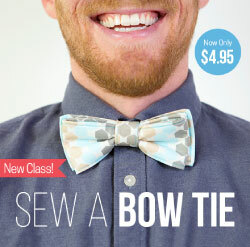 Just be careful not to snip to far into your patterns seam allowance. Just a little 1/8″ snip is all you’ll need to easily see it. To mark the dart point or button placements, I like to poke a small hole through the pattern and use a marker or chalk to mark that location. To mark a small hole, you could use an awl or even a pin. 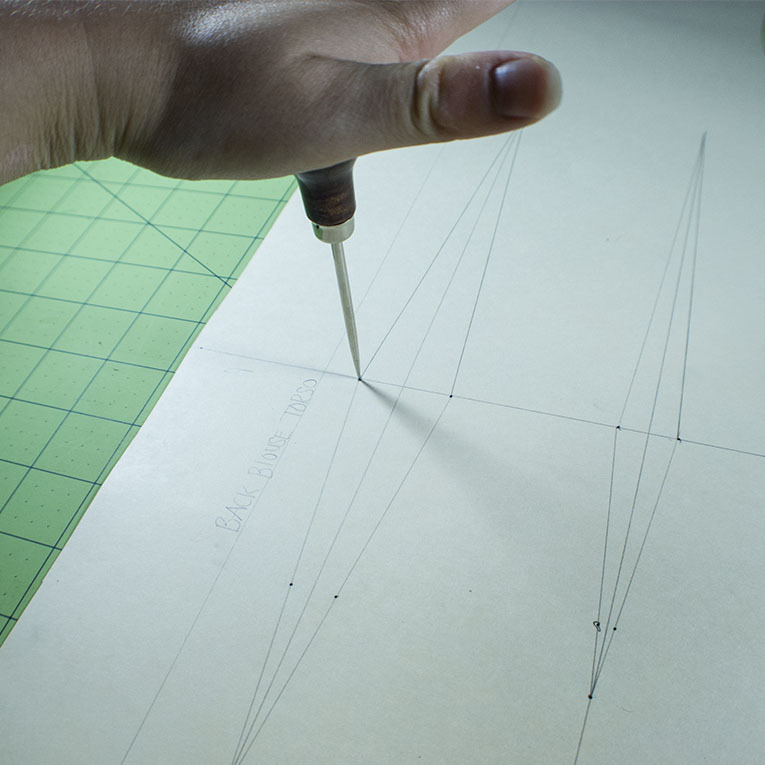 To draw in the dart legs, use a ruler and a marking pen/pencil and connect the point to the snip. TIP: Marking on the wrong side of the fabric is often times the best option. However, there will be some instances when you will want to mark on the right side of the fabric. 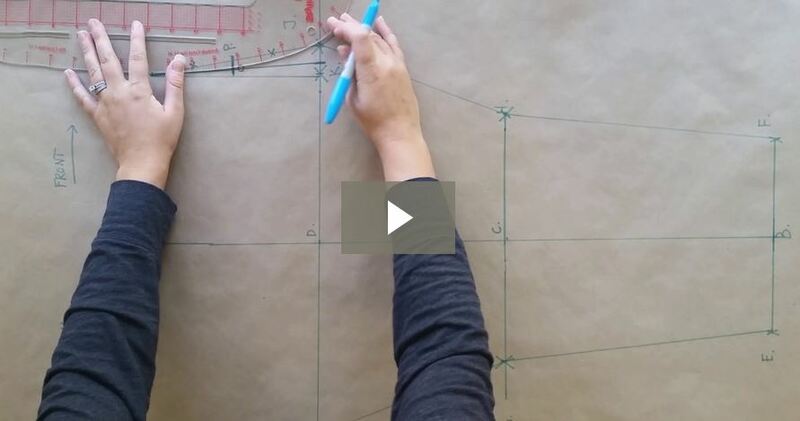 Again, there are many methods of cutting out your pattern pieces. Some people like to use pattern weights (see my favorite type of weight) and cut right around the pattern. 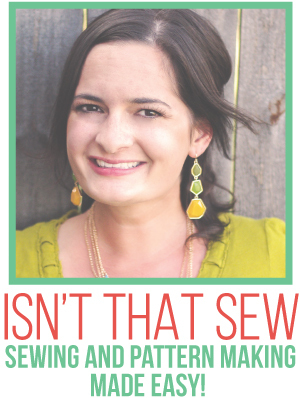 Some people use pins and pin the pattern to the fabric. Some people like to trace the pattern onto the fabric and then cut. I prefer the latter. Tip: It is a good idea to stabilize your fabric with paper to prevent slipping, especially stubborn fabrics like linings, chiffon, silks, and some knits. Try brown craft paper, shelf paper, or even tissue paper. 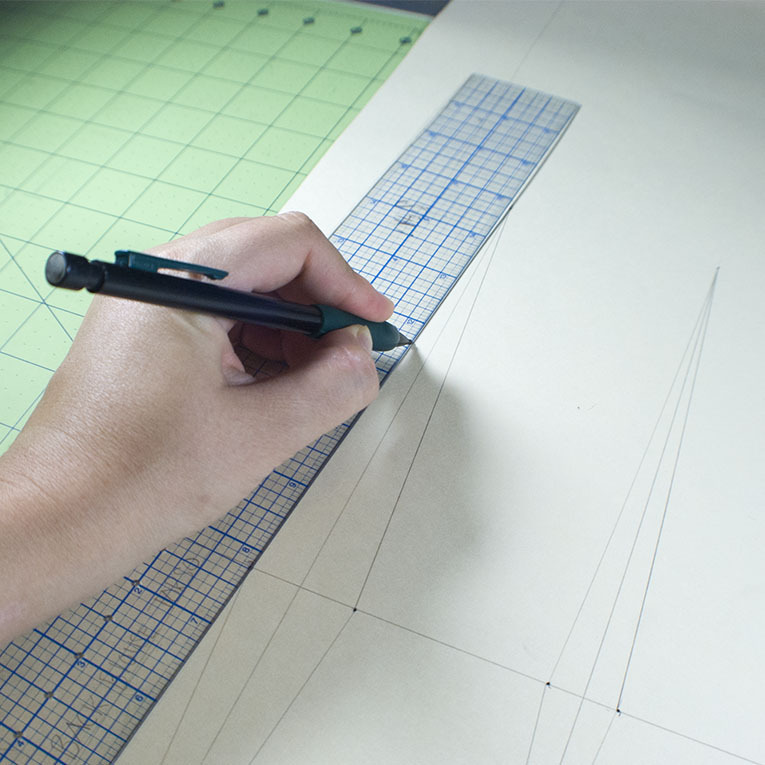 Using another piece of paper will help your fabric to stay in place while cutting and even sewing. Give it a try!